Welcome to Bangkok! Upon arrival at the airport, you will go through customs and immigration. Should you opt to purchase a transfer to your hotel; a representative will be waiting for you as you exit immigration. Arrive at your hotel, check in and do not give in to jet lag! There is so much for you to see and do! 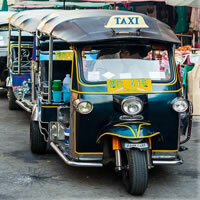 Start off soaking up this unique city and travelling like the locals by tuk tuk! Head to the Jim Thompson House conveniently located in the center of Bangkok, a museum housing the art collection of American businessman and architect Jim Thompson, the designer and former owner of the home. You can witness the large collection of historical Buddhist statues, Thai paintings, porcelain from China and the silk weavers at work. There are six traditional Thai-style houses that make up the complex and about a half acre of jungle foliage gardens. From here head west over to Chinatown about a 5 minute ride by taxi or tuk tuk where you can check out one of the oldest areas in Bangkok and grab some food from one of the popular street food vendors. Here you will find market stalls and shops and one of the best areas to shop for gold. A 5 minute walk down the road will bring you to Little India known as `Phahurat Market` where you will find the sprawling Sampeng Market, The Old Siam Plaza, The Sikh temple, and the India Emporium a four story shopping mall. Next head to Wat Arun the Temple of Dawn located on the west side of the Chao Phraya River one of the most beautiful temples in Thailand and is an absolutely stunning sight at sunset! With its riverside location and the unique design of the temple with colorful glass and spires that stand majestically over the water. You can end your evening on the Riverside where you will find a variety of restaurants and cocktail bars along the water and a great place for a romantic dinner cruise. Start your day early with a trip to The Grand Palace with The Temple of the Emerald Buddha; a visit to Bangkok would not be complete without seeing this spectacular and sacred site, undoubtedly the city`s most famous landmark. Experience the beautiful architecture and the intricate detail of the structure built in 1782. Wat Phra Kaew enshrines Phra Kaew Morakot, The Emerald Buddha meticulously carved from a single block of jade dating back to the 14th century. The complex is considered to be the spiritual heart of the Thai Kingdom. There is a strict dress code at The Grand Palace, no tank tops, no bare shoulders, no bare feet, and no see through clothes. Make your way over to Wat Pho which is located immediately south of The Grand Palace, this is one of the largest and oldest temples constructed almost 200 years before Bangkok became Thailand`s capital. It is home to the Reclining Buddha a 50 foot high by 150 ft wide reclining Buddha statue covered in gold leaf! 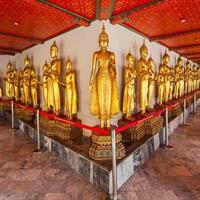 The complex also features the largest number of Buddha images in Thailand and is known as a place of healing! You can enjoy a traditional Thai massage here after your morning of sightseeing. You can take a 15 minute walk east from here over to Wat Suthat another impressive temple dating back to 1807 and contains the Buddha image Phra Sri Sakyamuni. Check out the eye catching swing at the entrance of the temple, an 89 foot tall giant red swing that used to be the focus of a religious ceremony! A great place for a great photo op! Here you can make the short trip to the famous Khao San Road a short street featuring food stalls, restaurants, swanky bars, clubs, stores and much, much more in a fun, friendly, laid back atmosphere! Or head to Pat Pong or Soi Cowboy for a taste of the much talked about Bangkok nightlife! 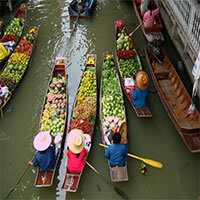 Today start off with a visit to Damnoen Saduak one of the most popular floating markets, located in Ratchaburi about an hour and a half outside of Bangkok, early morning is the best time to visit the area and experience where Bangkok got its nickname `Venice of the East`. A great place to start your day and fuel up with some of the delicious food options offered straight from floating kitchens! Take another hour and a half journey to Ancient Siam the Ancient City the world`s largest outdoor museum spread over 200 acres. 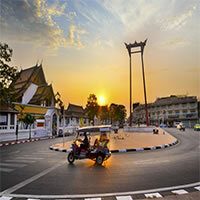 The city features 116 structures of the most famous monuments and attractions that make up Thailand. Head back to the Chao Phraya River to the legendary Mandarin Oriental and spend some time at the Oriental Spa voted among the best in the world! Relax in an oasis of peace and tranquility and enjoy a traditional Thai Massage. You can end your last evening in Bangko at the SiamNirami one of the largest stage productions in the world! The shows feature breathtaking scenery and colorful costumes with extraordinary special effects. Over 150 performers take the stage to demonstrate Thailand`s rich traditions on the world`s highest stage. 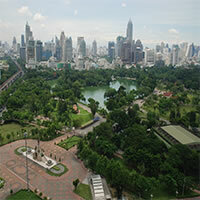 Should you be able to spend additional days in Bangkok then be sure to check out Lumpini Park a green oasis of nature in the heart of the city and the largest public park in Bangkok with a variety of things to see and do. Visit The Bangkok National Museum the largest in Southeast Asia featuring the largest collection of Thai history and art opened in 1874 by King Rama V to exhibit the royal collection of his father King Rama IV. Wat Saket knonw as the Golden Mount is a Buddist temple in the Pom Prap Sattru Phai district, dating back to the Ayutthaya period 1350 – 1767 AD. The grounds feature trees and typical Buddist structures it is one of the symbol of the city and a popular tourist attraction. Wat Traimit located in the Chinatown area is where the statue of the Golden Buddha can be found, a 10ft tall golden Buddha image that weighs more than 5 tons and is made of solid gold. 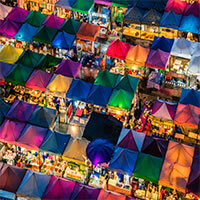 If one of your additional days in Bangkok is the weekend be sure to attend the Chatuchak Weekend Markets, the 35 acre area is filled with more than 8,000 market stalls where you can find just about anything for sale. Depart from your hotel to the airport for your return flight home. We recommend that you purchase a private transfer to the airport, if so the representative will meet you at your hotel with plenty of time to get you to the airport for your flight out.